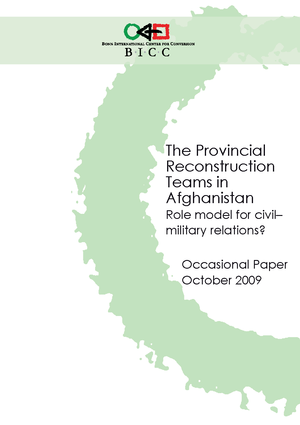 The Provincial Reconstruction Teams in Afghanistan: Role model for civil-military relations? The main purpose of this Occasional Paper is to provide a humanitarian perspective to the ongoing debate about PRTs as a role model for civil-military relations. It will analyze the security dilemma in Afghanistan and the impact of the PRTs on the delivery of humanitarian aid. It will further explore the consequences of ‘blurring the line’ between humanitarian aid and military goals. This Paper will draw upon the discussion within the humanitarian community, especially with German humanitarian NGOs, which have made clear their position on civil-military cooperation and the PRTs (VENRO, 2003; 2009). The German PRTs in northern Afghanistan will serve as a case study because the German government has put into practice a separation of roles based on an awareness of the different mandates of PRTs (Deutsche Bundesregierung 2003, p. 3f). • What is the impact of international military operations and the changing context of security and conflict in Afghanistan on different humanitarian actors? • What is the impact of the PRTs on the programs of humanitarian aid agencies and their concerns regarding the preservation of ‘humanitarian space’? • What are the lessons learned with regard to the cooperation of military and humanitarian actors within the PRT framework? The conclusion consists of a set of recommendations regarding the scope and limits of cooperation between armed forces and humanitarian agencies.